If you’re a sci-fi fan each day your robot fantasies creep a little bit closer to reality. This month a disturbingly creepy humanoid robot being referred to as “Alter” has hit the scene, courtesy of scientists in Japan (who’da thunk it? ), and he’s like something straight out of a movie — a bad movie, that is; a scary movie; a really creepy disturbing scary movie. You get the picture. Alter is what’s called a neural network robot. He is capable of generating his own moves in connection to stimuli. For instance, if the temperature is low Alter’s sensors detect this and he will begin to shiver in an effort to appropriately respond to the environmental stimulus. If you’re freaked out by horror movies utilizing dolls or wax figures (cue Vincent Price), this maneuver is ghastly. The Japanese have been working tirelessly on robotics for years now. And it doesn’t stop there. Augmented reality that includes holographic technology is already on display throughout the county. A lot of it is pretty cool and some of it is down right trippy, but Alter is something else all together. Maybe it’s because of his embedded neural network allowing him to move on his own, as described above. The tech behind this ability involves 42 pneumatic actuators and what’s called a central pattern generator (CPG). The CPG has a neutral network, which replicates neurons, allowing Alter to create movement patterns of his own. In addition to temperature, his sensors also detect noise, proximity and, oddly enough, humidity. As advanced as it is, Alter’s robot design leaves a lot to be desired as far as human-like movement. Instead, he gives his audience the very strange and creepy sensation that he is somehow alive, but in some parallel universe where Rod Serling still lives, maybe. Once again, the word disturbing comes to mind. If you’ve ever seen the old black and white movie with Barbara Stanwyck and Robert Taylor entitled The Night Walker, where Taylor tries to gaslight Stanwyck through the use of mannequins, you have an idea of Alter. The movement patterns are bizarre, to say the least. The singing Alter is able to muster is more like ambient music rather than actual words, and there’s nothing soothing or pretty about it. The best way to describe Alter’s movements is that they are reminiscent of someone without full control of their faculties. Apparently, this comes from the project’s desire to shoot the gap between programming and allowing for moving by one’s own volition — which is creepier yet. It’s scary enough that we can program robots, but being able to act on their own is just a stone throw away from every bad sci-fi robot flick we’ve ever seen, I, Robot included. It’s Alter’s neural network that’s in place that allows for the super loose degree of flexibility that researchers are calling "chaos" that sets him apart. His arms and freakishly large hands flail about as if he were having an emotionally challenged moment — or maybe tripping on hallucinogens. 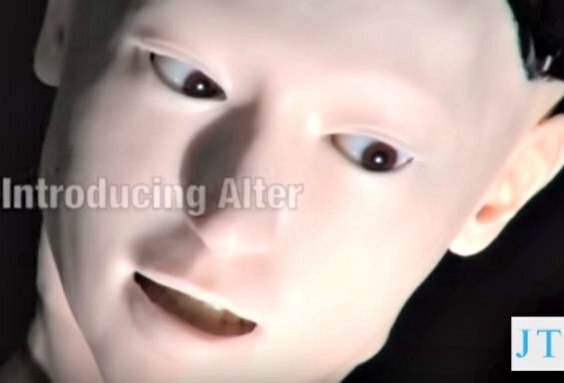 Developed by researchers at the University of Tokyo and Osaka University, Kouhei Ogawa, who has worked on previous humanoids, noted: "Alter doesn't look like a human. It doesn't really move like human. However, it certainly has a presence. Until now, making androids talk or interact for 10 minutes was an incredible amount of hard work -- simply to program something to react for that long. Alter, moving for itself, can do so easily." Alter was on display to the public earlier this month for a week at Japan’s National Museum of Emerging Science & Innovation. The Tokyo and Osaka teams hoped the interactions would inspire new ideas on what they should teach Alter next. Hopefully it will be Isaac Asimov’s three laws of robotics. How Has Gaming Changed The World? A New Documentary Aims To Find Out!